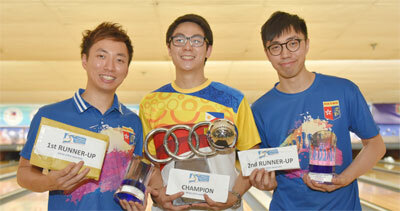 24th May, Manila: Kenneth Chua of TBAM-Prima-RP and Lara Posadas of PBAP-Bowlmart-RP gave Philippines its third double victory since 2010 in the Men's and Ladies' Open Masters stepladder finals of the 2017 Philippine International Open at Coronado Lanes. Chua, who rolled the tournament's first 300 and seeded second, out-classed 2007 Philippine Open champion and top seed, Wu Siu Hong of Hong Kong, 247-162 and 267-217 in the best-of-3 title match to win his first-ever international crown. Chua, the 25-year-old 2010 Asian Youth Championships silver medallist, had earlier eliminated another Hong Kong national and 2017 ABF Tour Thailand leg champion, Michael Mak in convincing fashion, 247-217 in the semi-finals. The Filipino picked up the top prize of 500,000 pesos (approx. US$10,000) and the champion's trophy, specially designed by world-renowned Filipino Artist and Scultor, Mr Joe Datuin, Grand Prize winner of the 2008 IOC Sport and Art Contest, Lausanne, Switzerland. Mr Steve Robles, Director of Philippine Bowling Federation presented the trophies and Ms Mely Lopa the prize money. Wu, the first runner-up, who topped the earlier Round 2 finals with 1741 to advance to the stepladder finals as top seed, settled for 250,000 pesos while his compatriot, Mak took home 125,000 pesos. 2016 Asian Schhol Masters gold medallist, Mostafa Almousawi of Kuwait missed the cut by just four pins finishing fourth. Meanwhile, 2010 Philippine Open first runner-up and top seed, Lara Posadas finally won her first Philippine Open title with an easy straight-set victory over second seed and winner of the semi-finals, Iliya Syamin of Singapore, 232-209 and 188-166 in the title match. Posadas, who also rolled 300 during her qualifying rounds, won 200,000 pesos (approx. US$4,000) and the champion's trophy. She had earlier topped the Ladies' Open Round 2 finals with 1692, 73 pins ahead of her nearest rival. Syamin, who defeated team-mate, Jermaine Seah, 223-203 in the all-Singapore semi-finals, settled for 100,000 pesos. The first runner-up was second with 1675 in Round 2 finals while third seed, Seah, who total 1615, took home 50,000 pesos. 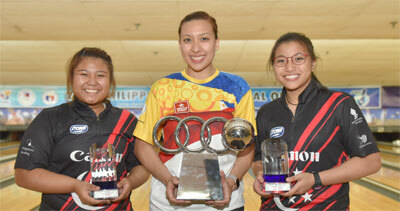 2008 Philippine Open Ladies' champion, Krizziah Tabora missed the cut for the stepladder finals by 37 pins with 1582. A total of 61 men and 23 ladies from 11 countries participated in the revived 2017 Philippine International Open during the qualifying rounds over best-of-two three-game series which commenced on May 13 culminating in the two days of final rounds. Qualifying for the Youth Open division will end on May 25 with the finals on May 26. The Masters finals for the Youth Under-16 division and the Senior division will be held on May 27. The championships will conclude with the Masters finals for the Associate division and the Graded division on May 28.